The fastest Mac available is for users who demand multi-core performance. Four years since Apple last shipped a desktop Mac with the word “pro” in the name, the iMac Pro has arrived. Holding down the high end of the Mac product line until the day (hopefully in 2018) when a new Mac Pro arrives, the iMac Pro fuses the look of the 27-inch 5K iMac with the priorities of a professional workstation. This is not a computer designed for the masses—a new iMac Pro starts at $5,000 and you can pay five figures for a high-end model. If you aren’t sure if you need the power of the iMac Pro, you almost certainly don’t. If, on the other hand, you are hungry for multi-core performance and a powerful GPU that will let you crank through intense tasks—in video editing, software development, photo and audio processing, science, graphics, and similar applications—this is the new Mac Pro you’ve been looking for, albeit in the shape of an iMac. There was a time when most serious Mac users used a professional desktop Mac. The Power Mac line (later renamed the Mac Pro) wasn’t just high end, but mid-range—if you were looking for the cheapest, least powerful Mac you could buy a Performa or iMac, but serious users bought a Power Mac. 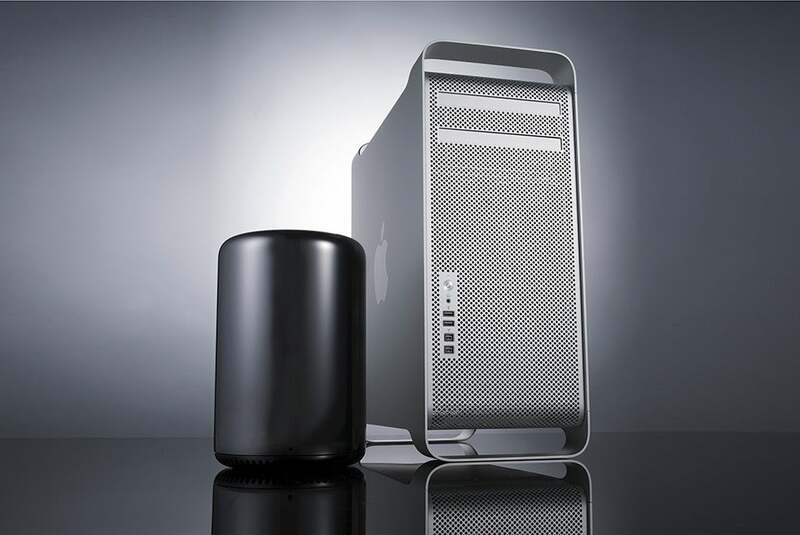 Second-generation (left) and first-generation Mac Pro designs. But over the past decade, Apple has boosted the power available in the iMac line while positioning the Mac Pro as an expensive product limited to the most high-end work. So many of the Power Mac chauvinists of 2000 became the 5K iMac users of 2015. I’m one of them. As a result, a “pro Mac desktop” doesn’t mean what it did. There are plenty of mainstream professional users with the need for decent computing power who don’t need to buy anything beyond a 5K iMac. Still, there are a bunch of tasks that require pushing the edges of performance beyond what the 5K iMac can provide. And I have to admit, lately I’ve realized that I don’t fit comfortably in that category either: The more video editing and audio work I do, using software that maxes out my iMac’s processor cores and still takes excruciatingly long to finish doing its work, the more I come to desire faster processors, more cores, and faster storage. The iMac Pro delivers all of that. When I swapped my 2014 5K iMac for an iMac Pro, my workspace didn’t change much. At a glance the iMac Pro is just an iMac (with a 27-inch 5K display with support for the full P3 color gamut) in a slightly darker shade of silver. (And yes, the peripherals supplied by Apple—a wireless keyboard with number pad, mouse, and optional trackpad—are available in the same Space Gray shade, for now only with this computer.) Inside, though, this is not like any iMac ever before made. I bought and tested the $4,999 base model, which is powered by an 8-core 3.2GHz Xeon W processor. (Apple’s also offering 10-, 14-, and 18- core versions.) The base Xeon W supports Turbo Boost up to 4.2GHz, which is useful when you’re stuck with particular programs that aren’t written to spread the processor load out across multiple processor cores. The base-model iMac Pro also comes with 32GB of RAM (configurable up to 128GB) and 1TB of SSD storage (configurable up to 4TB). And the biggest powerhouse in the system might be the Radeon Pro Vega GPU. About that RAM: The iMac Pro’s RAM slots are upgradeable, but only by Apple or an authorized repair center. To get in to upgrade the RAM, someone’s going to have to pull the display off. As a result, if you buy an iMac Pro you should buy it with the amount of RAM you expect to need for the next year or two. But the good news is, if you do need more RAM later, the iMac Pro is upgradeable. It’s just not an easy upgrade as it is on the 27-inch 5K iMac. The SSD storage on the iMac Pro is actually two striped banks of NAND memory controlled by an Apple-designed T2 processor. (More on the T2 in a bit.) According to Apple, the SSD in the iMac Pro can read at up to 2.8GB per second and write at up to 3.3GB per second. It’s really quite fast. 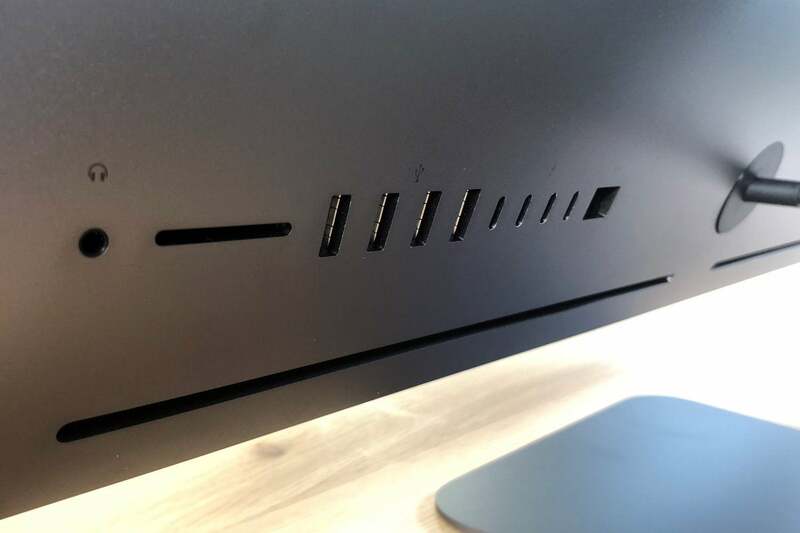 iMac Pro ports (left to right): headphone, SD card, 4 USB 3 ports, 4 Thunderbolt 3/USB-C connectors, 10Gb ethernet. I tested the iMac Pro against my existing 5K iMac (the original 2014 model with an SSD, 16GB of RAM, and a 4GHz Intel Core i7 processor) as well as, for some tests, a 2017 5K iMac with a 3.6GHz Intel Core i7. I tried to run real-world tasks, the sort of thing that I bought the iMac Pro to do faster than my old iMac. These were largely tests involving audio processing and operations in Logic Pro, exports from Final Cut Pro, and some other video and audio processing tasks. On the video side, I encoded a 1080p MKV video file into H.264 using HandBrake. On the audio side, I removed background noise from a three-hour-long audio file using iZotope RX 6’s Spectral Denoise feature, synced audio with the unreleased sidetrack sync tool, encoded a podcast MP3 using Marco Arment’s Forecast, and bounced a 24-track, 22-minute-long Logic Pro project with numerous track effects. Results in seconds. Shorter bars/lower results are better. Click to enlarge. Results are scores. Longer bars/higher results are better. Click to enlarge. Results in frames per second. Longer bars/higher scores are better. Click to enlarge. When it comes to single-core performance, however, the Xeon processors in the iMac Pro don’t have much of an opportunity to shine. The iMac Pro offered roughly the same single-core performance as my three-year-old i7 5K iMac, and a 2017 5K iMac would undoubtedly outshine it on those tests. If the work that you do is largely confined to a single processor core, the iMac Pro is not the product for you. You’d be better off with a 5K iMac, which will be faster at those tasks—and a lot cheaper, too. As I wrote earlier this month, the iMac Pro notably includes an Apple-designed ARM processor, the T2, to manage numerous tasks previously done by separate controller components. This isn’t the first Mac to mix an Apple-designed ARM chip with an Intel processor—every MacBook Pro with Touch Bar comes with the T1 chip—but the iMac Pro’s T2 augurs a future where the Mac is made more secure and efficient thanks to an Apple-built helper chip that works alongside the CPU and GPU. The T2 controls the iMac Pro’s stereo speakers, internal microphones, and dual cooling fans. It provides an Image Signal Processor for the upgraded 1080p FaceTime camera, and it shows—the image quality of that camera is dramatically improved over previous iMac cameras. Most impressively, the T2 acts as the system and disk controller, driving two banks of NAND memory that serve as the iMac’s internal SSD and seamlessly encrypting all data stored to disk. This is the first iMac Pro and the first Mac with a T2, and I wasn’t surprised to notice a few quirks. A few times, I’ve entered my password on startup, only for that entry to be greeted with a bounce animation indicating that the password was entered incorrectly. After a few seconds, the iMac Pro would continue logging me in—so apparently my password was correct after all? Strange. I also failed twice to install Boot Camp before it finally succeeded. Speaking of the fan on the iMac Pro, it’s worth taking a moment to consider the cooling system in the iMac Pro. Now, as someone who has only used the 8-core model, it’s safe to say that I haven’t seen the amount of heat that can probably be put out by the 18-core version. What I can say is that the iMac Pro’s fans are whisper quiet—even in a quiet room I couldn’t really hear them unless I stuck my ear up to the back of the iMac Pro. And when under load, the fans didn’t audibly rev up as they do on the 5K iMac. In fact, the only really sign that the iMac Pro was under load was that the air blowing out the back was warmer. The iMac Pro is a Mac Pro in the body of a 5K iMac. If you’ve been using a 5K iMac but desperately need better performance from software that’s aggressively multithreaded, the iMac Pro will supply that performance. (If your go-to software does not take advantage of those extra cores, this isn’t the Mac for you). While we don’t know anything much about the forthcoming Mac Pro, it will presumably be more customizable than the iMac—especially when it comes to external displays—while the iMac Pro will more or less remain what it is today. What it is, today, is the fastest Mac around, with fast processors, storage, and connectivity, all attached to that gorgeous 5K screen. If you aren’t sure if you need an iMac Pro, you probably don’t. But for those of us who can put the 8, 10, 14, or 18 cores in iMac Pro to work, along with the Radeon Pro Vega GPU and the fast SSD storage, it’s an amazing combination of Mac Pro and 5K iMac. For those needing the fastest multi-core CPU performance, GPU performance, and SSD speeds in a Mac, the iMac Pro delivers.